Contrary to what we all say, you don’t just ‘do’ a poo. It’s a lot more involved. You actually have to build it, prepare it for shipping & then move it (well the moving kinda happens at the same time as the building & prepping for shipping…like a mobile building team). It’s just like building an impressive sculpture or artwork, while simultaneously shipping it to its destination (obviously Uranus). Am I consuming enough fibre, with plenty of variety? If you’re slack in this department, pooing for you will be like trying to create a giant outdoor sculpture using a handful of play-doh & a team of 2 people – you’ll never succeed because you simply don’t have enough material to work with or enough workers. Good dietary poo-building materials include fruit, vegetables, nuts, seeds, whole grains, & legumes. Unrefined plant food basically, & not just a small amount. To succeed in ‘poo production’ your diet needs to be mostly made up of unrefined plants (have a think about what your dinner plate looks like – chances are it needs more plants). Eating a large range of plant products is also crucial. More types of fibre = more types of gut bug (that’s a good thing, it means you’ll have a nice diverse team of workers with many skills!) Plant food provides food to support plenty of microbes (your team of builders) who will gobble it up, use it as an energy source to grow & carry out all their amazing helpful duties & reproduce (with a healthy poo as the byproduct). A poo is largely made up of these microbes (the accumulated bodies of exhausted / dead workers as well as loads of still-alive ones). There is also of course water, some left-over undigested plant matter & some bits n pieces of you from your gut lining & its secretions. Behold! A multi-media, living sculpture! You’ve just got to keep providing the inspiring building materials to keep your skilled workers happy & busy! Do I have enough team members? Your gut-microbes are your poo-builders & sculptors (among other things, that’s just one of their more obvious roles). They like to keep busy, but they also appreciate a rest – so give them plenty of plant foods to eat but also provide some downtime (this will allow your gut to clean up after them as they build & sculpt & do their thing). Some people have a poo problem because there is a problem with the workers. Their population may have been wiped out by repeated bombing (with chemicals, medications, antibiotics etc), or there may be a skill shortage. If you’re missing important microbial strains you could be trying to build a house without a plumber or painter or electrician. You can still do it, but the building process won’t be so smooth & the end product will be imperfect. 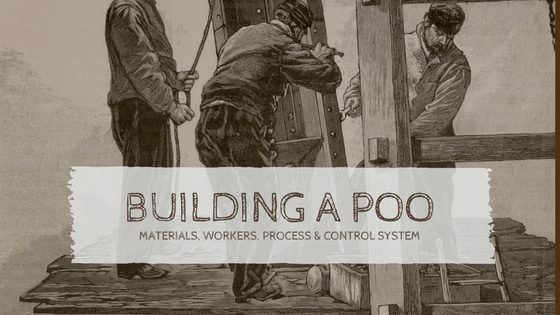 So, if your poos are imperfect / you feel like the building process isn’t going smoothly – get some new workers! Ask at your local health food store for a good multi-strain probiotic (you only want workers with good references)! And grab some kefir, kimchi, sauerkrout & yoghurt while you’re in there. How are the roads? Think of your gut as the ‘road’ & your nervous system as the computer system controlling what goes where, at what speed & at what time. So the road needs to be kept in good condition, it needs constant maintenance & repair (which your workers will mostly do while they’re building, as long as you’re supplying the plant foods they need). The digestive ‘road’ has it’s own favourite building materials needed for big repairs as well. Along with what the workers generate from the breakdown of fibre (short chain fatty acids), your gut also loves the amino acids glutamine, glycine & proline (make bone broth a regular addition to your diet if your gut-lining needs repair work). Are you in charge? How’s the control tower – aka your nervous system? This also plays a huge role in determining how things move along. Too stressed & you can cause major blockages or even the opposite, uncontrollable flow of unfinished work (loose stool). Worse still is a constant alternation between the two! Sleep well, exercise well & have a plan to help you when stress creeps in, it will always be potentially there ready to get you, you just need to be prepared & have your coping mechanisms at the ready (& not just wine – I’m talking yoga, meditation, deep breathing, massage, getting out into nature, connecting with friends, having a good laugh…& maybe a wine every now & then – whatever floats your boat). These things help improve your gut function via activating the ‘rest & digest’ side of your nervous system (most of us spend far too much time in the ‘fight or flight’ response – no wonder digestive issues are so common)! So…you don’t just ‘do’ a poo. It’s not that simple! You need to constantly supply the correct building materials, attract & keep enough good workers to build it & ensure you have a working delivery system to ensure it gets to its destination on time, every time. If you need some help with the materials try Blend11 or NeoBlend, & if you’d like some more workers to help out try a probiotic. PondWater can help with the road repairs & maintenance as well as provide some extra special building materials. If you need more support – request to join our gut health community Eat Play Poo or email me anytime. You too could become a great builder / sculptor! This entry was posted in Gut Health and tagged bristol stool chart, constipation, fibre, FODMAP, gut health, IBS, prebiotic, probiotics.